Please note that the content of this book primarily consists of articles available from Wikipedia or other free sources online. 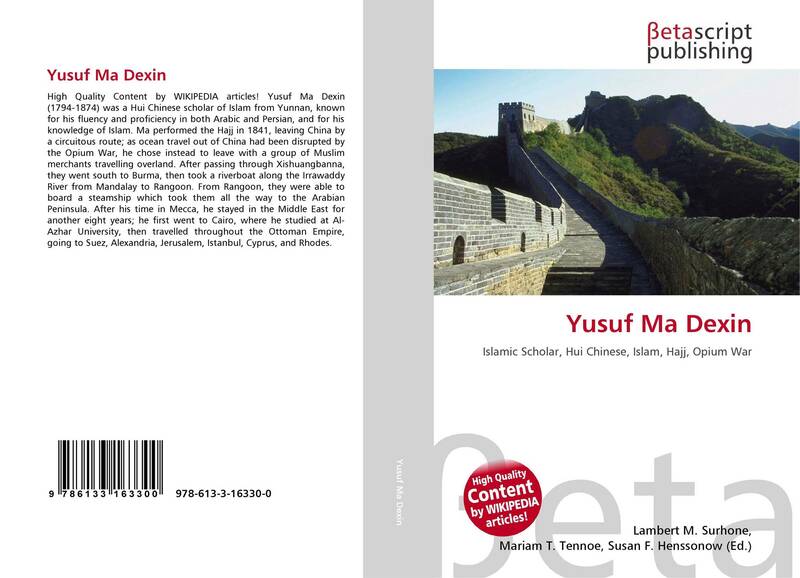 Yusuf Ma Dexin (1794-1874) was a Hui Chinese scholar of Islam from Yunnan, known for his fluency and proficiency in both Arabic and Persian, and for his knowledge of Islam. Ma performed the Hajj in 1841, leaving China by a circuitous route; as ocean travel out of China had been disrupted by the Opium War, he chose instead to leave with a group of Muslim merchants travelling overland. After passing through Xishuangbanna, they went south to Burma, then took a riverboat along the Irrawaddy River from Mandalay to Rangoon. From Rangoon, they were able to board a steamship which took them all the way to the Arabian Peninsula. After his time in Mecca, he stayed in the Middle East for another eight years; he first went to Cairo, where he studied at Al-Azhar University, then travelled throughout the Ottoman Empire, going to Suez, Alexandria, Jerusalem, Istanbul, Cyprus, and Rhodes.